Ending up with a beautifully designed kitchen is all about balancing layers. A floor is a layer, cabinets are another layer, wall and countertop colors and designs are yet another layer. Lighting and appliance style and color are layers and then all your accessories and ‘things’ that sit on countertops are additional layers also. If you choose a bright colored, patterned floor, and a busy granite countertop and a detailed wallpaper pattern, even if they all coordinate in color, the end result of your finished kitchen can be too busy or heavy. Notice that I used the word ‘balance’. If one layer is simpler, then another layer can be more intricate or detailed. If all is simple, you run the risk of being boring, but if all layers are detailed, then no one area or detail can be appreciated as the whole look is a busy jumble. Here is how to balance it all out so that the finished product looks fabulous! Floors, walls and ceilings are your blank canvas. They take up the most square footage or space. If you go simple and plain on these areas, then you can choose more detailed countertops, cabinets and accessories. If however, you fall in love with an intricate inlaid wood floor or a beautifully patterned tile that you just have to use in your kitchen, then you need to play it simple with cabinets and countertops so that the beauty of the floor can be appreciated. 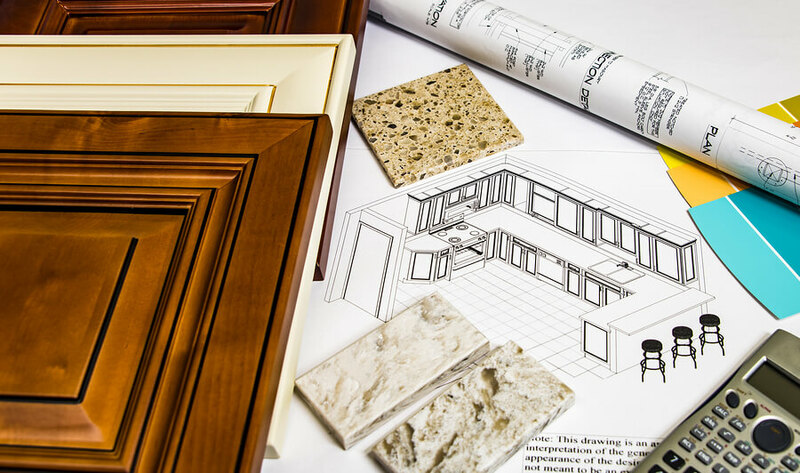 When you are starting from scratch in a kitchen, the elements that you are working with and choosing first are floor, ceiling, wall, doors and trim. It is tempting to pick patterns and colors as that big, blank looking room seems to beg for it. Stay restrained however in your initial choices so that the cabinets of your dreams and the countertop that you just have to have will be the real stars of your new space. Never forget that good design is accomplished in layers and that a finished kitchen contains dozens of layers once you have small appliances, accessories, art, open shelving revealing dishes and glassware and pot racks all in place! All vie for attention with one another, so to achieve that final perfection that you want, you need to balance out simplicity (lots of it), with small amounts of detail. Now let’s address color as all the layers that we have been speaking of have color of some sort. Just like items that have shapes and sizes (appliances, flooring, countertops) have to be balanced with each other, so does color. Imagine choosing a fun retro refrigerator that is fire engine red. You also fall in love with the retro red and white polka dot wallpaper and matching fabric for curtains. Don’t forget that you are going to have all those red small appliances like that retro toaster and stand mixer, as well as red throw rugs, red dishtowels and red canisters on the countertop. Your dishes are red, your mixing bowls and coffee mugs are red and even the clock on the wall is red! What happened to that fabulous red refrigerator? It got lost in the red stampede! OK, I admit that red can be naturally overwhelming (but I did want to make my point about overuse of one color), but what if you fell in love with a gorgeous wallpaper (wallpaper is making a comeback) that has about five colors in it? What do you do? Think restraint! Yes, get the wallpaper and paper all four walls if you want, but then pick only two or three (at the most) of your favorite colors in the paper and use them in small amounts around your kitchen. Another way to approach a kitchen with color is to literally pick your two favorite colors and balance them out around the room. Then, pick a metal as an accent. For example, white cabinets and floor, black sink and cooktop, white countertops, black countertop on the kitchen island. Try a mixture of black and white accessories and small appliances, a black and white wallpaper – and then add zing with a brass faucet, handles on the cupboards and brass lighting fixtures. Don’t add in any other colors and you have a simple, striking look that is balanced in every way. Balance means going simpler in one area so you can be more detailed in another. Balance out size, color and pattern carefully and the finished product will all work together and look as fabulous as you first imagined.